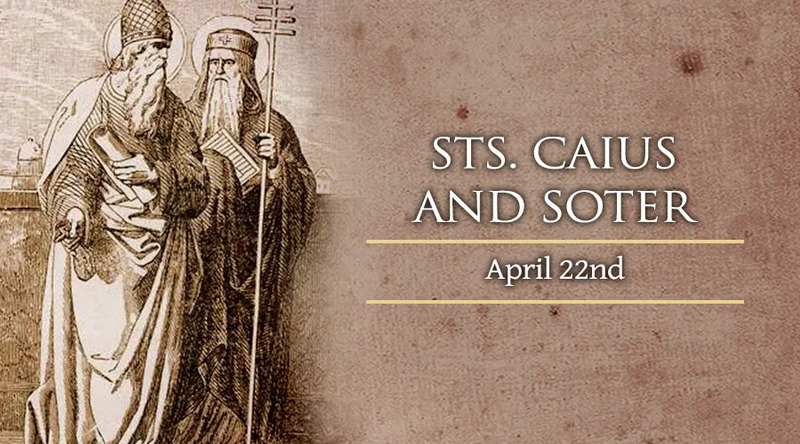 Cauis and Soter, Popes of the early Church, are both venerated in tradition as martyrs, though no reliable account of their martyrdom survives today. In the same letter of Dionysus we learn that Pope Soter had written a letter to the Corinthians which was read in the Church alongside the epistle of St. Clement and was held in high esteem. Though his kindness extended to all persons, he was a fierce opponent of heresy, having been said to have written an encyclical against Montanism – the teachings of a heretical sect which believed that a Christian who had sinned gravely could never be redeemed. Pope St. Caius reigned for 13 years from 283 until his death in 296 just before the Diocletian persecution. He was a relative of the Emperor Diocletian – instigator of one of the last great persecution of Christians in the early years of the Church. Early in his papacy Caius decreed that a man must be a priest before he could be ordained a bishop. He is said to have been driven into hiding in the catacombs for eight years whence he died a confessor, however the source from which this information is gleaned is considered unreliable by most historians. Both St. Soter and St. Caius are buried in the cemetery of St. Calixtus and are venerated on the date of the death of Pope St. Caius.